It is just another peaceful afternoon; your kids are happily jumping on the trampoline you bought and you are inside the house working on few work projects, but seeing them having fun makes you want to join them. So, you close your laptop, put your iPhone on do not disturb and you head outside, you see the smile on your kids’ face as they realize you are about to jump and burn some energy with them. You hop on the trampoline, but something immediately ruins the party. You accidentally lay your eyes on a spring and notice the one thing that shouldn’t be there: rust; rust on trampolines is a big no-no. You tell your kiddos that it’s schoolwork time, they roll their eyes at you, snort and leave. But now you have a greater mission than indulging your children’s whims: saving your trampoline. Have you ever found yourself in this situation? If you own a trampoline, the answer is probably yes, but here’s what you have to do to prevent and remove rust from trampolines. Your trampoline might be rusting because the soil is acidic? Rusty trampoline springs are very dangerous since the rust is weakening the metal material which they are made of, jumping on a mat attached to rusty springs can end really bad. 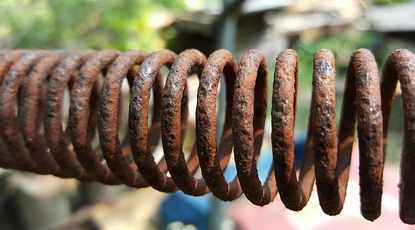 Picture multiple springs popping off as you jump on it. Really not a good scenario, right? Especially if you imagined the springs breaking but you couldn’t imagine where you would end if such thing happened. 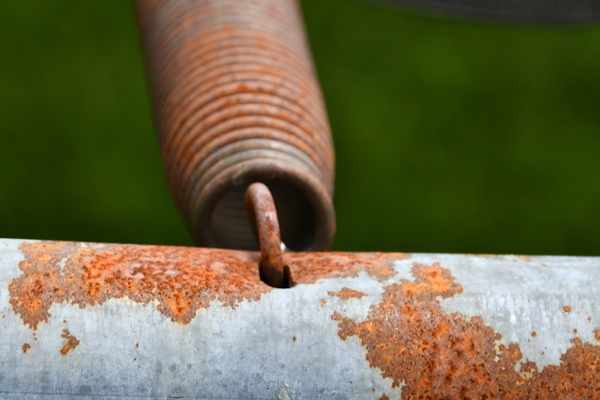 Rusty springs should be replaced if they are significantly corroded, but if they just started forming rust you can either change them or clean them. 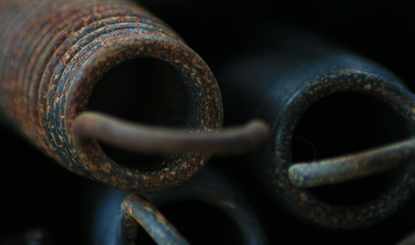 You can easily clean the rusty springs and prevent rust from reforming by using an easy DIY method. First of all, mark all the springs with rust signs with red electrical tape so that you will remember where you need to work on. Prepare aside a mix of half a cup of salt with the juice of two lemons or two limes. Then, with a wooden spatula apply this mixture directly on the rusty spots you previously marked with the red electrical tape. Let it sit for at least 2-3 hours, then you can use an old toothbrush or whatever you prefer, to brush away the paste and the rust. Then you should rinse the springs with a garden hose fitted with a sprayer. Now you should make sure to dry the springs with a cotton cloth and apply petroleum jelly to prevent rust formation. If you spotted light signs of rust on the frame and legs of your trampoline you should intervene before it’s too late and make the frame and the legs waterproof. With these easy steps, you will be able to remove the rust from the trampoline. Use a sanding block and sand off all the metal surfaces that already have rust on it, you should scrape the sanding block on these spots until all you can see is metal, then with steel wool wipe away the residue of rust. Now you should paint all the metal parts of the frame with rustproof and waterproof paint, make sure you give it two coats. Now your frame should be protected. 1) If you haven’t bought a trampoline yet you should inform yourself whether the frame is galvanized both inside and outside. This will prevent rust from forming. 2) If you already have a trampoline but the metal parts are not galvanized, you should protect your trampoline from the weather changes and all the moisture by using a cover. You should make it a good habit to cover your trampoline every time it is not being used and during cold winters. ​3) Store your trampoline indoors, in a dry place, during long periods of inactivity. ​4) You should also apply a water-repellent solution that will protect your trampoline from rainfalls. 5) Set your trampoline away from potential pool water splashes and/or sprinklers. If you discover that this is your case and the metal parts of your trampoline are not galvanized, you should consider setting your trampoline on a PVC surface or synthetic grass and you might want to paint your legs with extra layers of anti-rust paint, so the coating will get harder and it will be more difficult for the rust to penetrate. Moreover, if you choose to rely on a PVC surface make sure the legs are securely anchored so that as you use the trampoline it won’t slide and make contact with the acidic soil. Now that you know how to prevent and defeat the dreaded rust, you are ready to save the day… and your trampoline. We are glad you did not choose to overlook even the slightest sign of rust on your trampoline. Picture this: you will be jumping again with your kids on a rust-free trampoline and you won’t have to worry about unpredictable springs or other pieces breaking and people getting seriously injured. Your kids will be playing again in a safe environment. It feels much better, right? This is all we care about.